Augustine of Hippo (November 13, 354 – August 28, 430), also known as Augustine, St. Augustine, St. Austin, St. Augoustinos, Blessed Augustine, or St. Augustine the Blessed, was Bishop of Hippo Regius (present-day Annaba, Algeria). He was a Latin philosopher and theologian from Roman Africa. His writings were very influential in the development of Western Christianity. 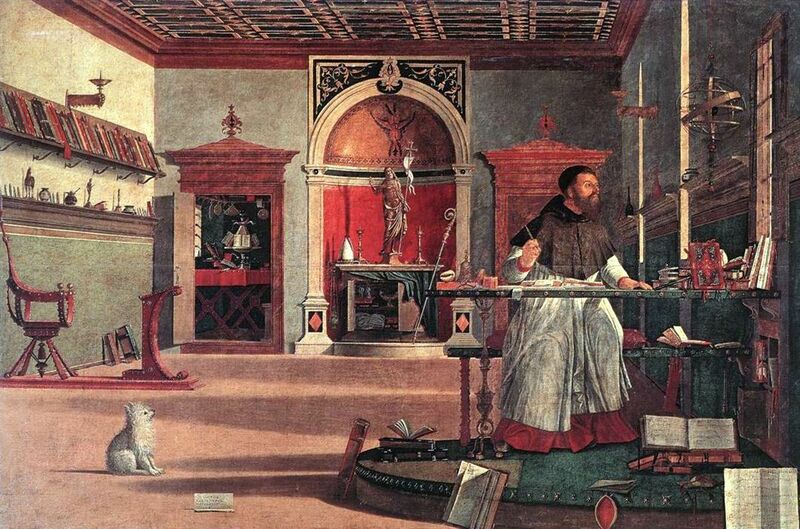 According to his contemporary, Jerome, Augustine "established anew the ancient Faith." In his early years he was heavily influenced by Manichaeism and afterward by the Neo-Platonism of Plotinus. After his conversion to Christianity and baptism in AD 387, Augustine developed his own approach to philosophy and theology, accommodating a variety of methods and different perspectives. He believed that the grace of Christ was indispensable to human freedom, and he framed the concepts of original sin and just war. When the Western Roman Empire was starting to disintegrate, Augustine developed the concept of the Catholic Church as a spiritual City of God (in a book of the same name), distinct from the material Earthly City. His thoughts profoundly influenced the medieval worldview. Augustine's City of God was closely identified with the Church, the community that worshipped God. In the Catholic Church and the Anglican Communion, he is a saint and pre-eminent Doctor of the Church, and the patron of the Augustinian religious order; his memorial is celebrated 28 August, the day of his death. He is the patron saint of brewers, printers, theologians, the alleviation of sore eyes, and a number of cities and dioceses. Many Protestants, especially Calvinists, consider him to be one of the theological fathers of Reformation due to his teaching on salvation and divine grace. In the Eastern Orthodox Church he is blessed, and his feast day is celebrated on 15 June. Among the Orthodox, he is called "Blessed Augustine", or "St. Augustine the Blessed". Augustine was a bishop, priest, and father who remains a central figure, both within Christianity and in the history of Western thought, and is considered to be the first medieval man and the last classical man. In both his philosophical and theological reasoning, he was greatly influenced by Stoicism, Platonism and Neo-platonism. He had influence as a theologian and thinker and influenced St. Thomas Aquinas, Protestant reformers and modern-day Ministers and authors. He also wrote numerous works (books, letters and sermons). One of his books is called 'Confessions'. Augustine ruminates herein on the nature of time, asking, "What then is time? If no one asks me, I know: if I wish to explain it to one that asked for, then I do not know." He begins to define time by what it is not rather than what it is, an approach similar to that taken in other negative definitions. However, Augustine ends up calling time a “distention” of the mind (Confessions 11.26) by which we simultaneously grasp the past in memory, the present by attention, and the future by expectation.